Danny Briere practiced the last three days in hopes to have enough strength in his legs to face his former team, the Buffalo Sabres on Tuesday. But after writing himself into the lineup, coach John Stevens had some words with the 31-year old center and managed to change his mind on playing, meaning Briere will miss yet another game with a groin injury. 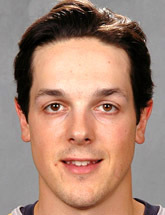 Briere has only played 12 games all season, scoring five goals and four assists during that span. Briere’s latest setback happened last Thursday against the Calgary Flames, when Danny pulled himself out of the line up late in the second period due to pain and weakness in his legs.